Chocolate is delicious and better for your teeth than caramel. Unlike the sticky counterpart, chocolate does not stick to teeth and is easily washed away by saliva. Use this base recipe to dip your apples, and top with one of the topping variations. In a small, microwavable bowl, melt the chocolate slowly in the microwave. Pierce your apples in the center with the popsicle sticks. Dip the bottom half of the apple in the melted chocolate. Turn to cover the entire fruit. Top your apple [see Chocolate Dipped Apple Toppings for variations]. Place the finished apple on a parchment-lined cooking sheet. 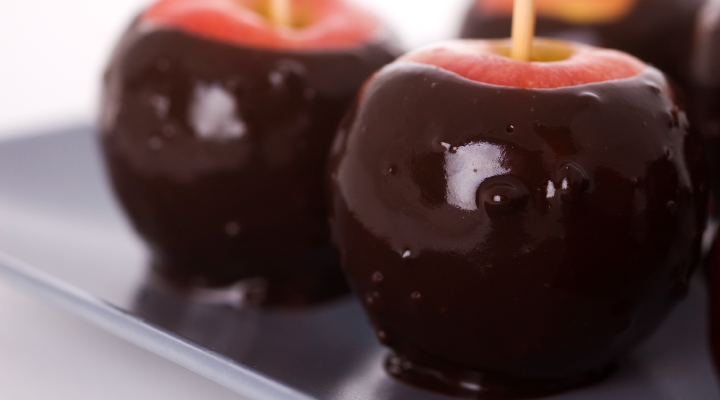 Enjoy these Halloween chocolate apple treats — even your dentist would approve!